Mr. Krispers Giveaway ~ the 2 WWP Snappy Chips!! Ok all ~ It’s Giveaway time! But, before I get to the Giveaway Details, let me just tell you that The Husband said he’d take one for the “team” today and break open a bag to try them out since I am on Bikini Bootcamp Restriction 😀 He’s funny! I let him pick any flavor and he picked BBQ to try first. You get 35 of these chips for 2 Weight Watcher Points (110 cal, 2.5 g fat, 1 g fiber). Check out how much crunch you get for a serving. Did I mention that this flavor is not only certified Gluten Free, 100 % all natural, but VEGAN. Check out the nutritionals…. 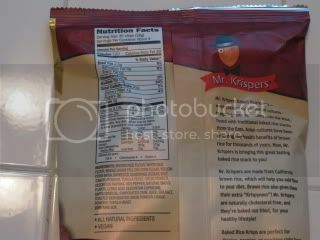 Mr. Krispers intrigued me when I heard of them because all of their products are made with 100% natural ingredients, contain 10-11 g Whole Grains Per Serving, are baked, never fried, Certified Gluten Free and you can recognize ALL the ingredients on their package!!! These are all things I look for in a healthy snack! THE REVIEW: He actually LOVED them and gave them 4 out of 5 stars. He ate them straight up and put them in his soup. I may or may not have stolen 2 of these chips. 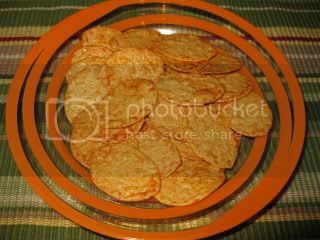 I LOVE how light and airy they are but they are super crispy and crunchy. 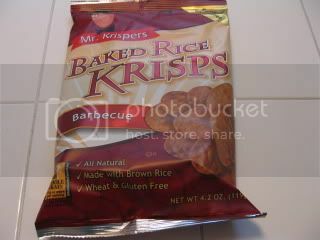 They are not like any rice chip I’ve ever had. The BBQ flavor has a little kick to it that makes it as well. 1) Leave your FIRST comment below telling me which flavor you most want to try. 2) If you have a blog, link back to this contest and leave a SECOND comment with the link letting me know. 3) TWEET about this Giveaway and leave a THIRD COMMENT telling me you did for a THIRD entry. These bags are ALL the FULL SIZED bags with 4 servings per bag – that’s a whole lot of crisp. I will also include a coupon for each winner so they can head out and buy more. I am giving away 1 of each of the 4 flavors I have and two of them are VEGAN!!! FOUR RANDOM WINNERS will be drawn using randomizer.org. This giveaway is open until Friday, June 5th at Midnight (PST)! Good luck, good luck! « Who knew I LIKED Papaya…. i twittered about your giveaway. twittering is so addicting! haha i just started about a week ago. i'm going to link back too! I would love either of the vegan flavors, but maybe barely-leaning towards the BBQ flavor. Thanks for linking to my giveaway in your last post!! You're the only one with three entries!! Yay! I love those! I buy the "knock off" ones from Trader Joes; they are so good! I would love to try the Nacho flavor! I have never seen these before, I would love to try! And, at 2 points you can't beat that! I definitely want to try the Sour Cream and Onion flavor! I'll link back and twit right now! I just twittered and linked! Mmm BBQ would be my choice! 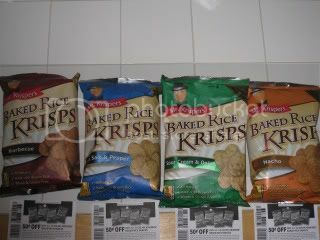 Are they similar in texture to PopChips? Either the salt and pepper or BBQ chips sound great! I'd love try these. I would love to try BBQ! I am dying to try the BBQ!!!! I linked you to the top of Uncovering Me! you and your fun giveaways! the bbq look best to me. your hubby is so cute! ill be linking back later tonight, you know it! I'm a lurker, but these just look so yum I have to join in the fun!! BBQ and Salt n Pepper both look really tasty. p.s. I linked back to you, too! I want to try those Sour Cream and Onion! I would love to give the nacho flavor a try! I don't have Twitter, but if I did I would Tweet you! I tried them all but am in love with the sour cream n onion so I choose that! I would love to try the BBQ flavor! i want to try the salt & pepper flavor! thanks for this giveaway!